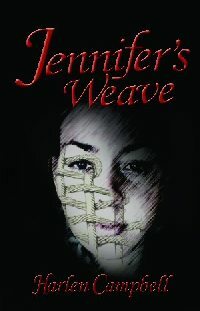 Jennifer’s Weave is technically a sequel to my first published book, Monkey on a Chain, but it is a bit more closely tied to Monkey than is usual for series books. That happened because the main character, Jennifer Murphy, first appeared in Monkey as a stock figure designed to emphasize Porter’s isolation, but she kept pushing back into the story, until by the end of it she was helping April count a fortune in jewels on Porter’s kitchen table. She was a puzzle I had to explore, so when I needed a convenient spot to drop the corpse that triggered the next book, I picked her kitchen floor. But no dead man exists in isolation. Each lies at the heart of a constellation of questions: Who was he? How did he come here? Who loved him? Who hated him? What part did he play in the life of the woman who found him and ran? That was enough for a start, anyway. I began writing, and within a few pages a detective with the NM State Police gave the dead man a name: Juan Murphy. Suddenly there was a connection between Jenny and the body, and her character became far more complex. As I wrote, the first part of the story reflected my interest in Jenny. I’d made her a weaver without knowing why, but that occupation suddenly made sense. What had been a random choice became a metaphor, and Porter’s search for a killer hinged on his ability to read the warp and the weft of the choices that formed the fabric of her life. I’d always seen Rainbow Porter as a damaged character. In Monkey, I imagined him as damaged by the war. With the new story I realized that the war was just the blow that fractured him, much as a sculptor’s hammer will break a marble slab along a hidden fault. In Porter’s case, that break didn’t weaken him so much as it left him with sharper edges. He became more dangerous, less human. Jenny was affected differently. What shattered her psyche left her unable to accept a complete human connection; she could love, but she would not be loved, and the two flawed characters were not compatible. As you might imagine, this sort of realization can complicate the process of writing a book. When it became obvious that Porter and Murphy had no future to offer each other, I began to wonder what kind of woman could fit into his life. About the same time, the book started feeling like it was running a little short. The search for Jenny had Rainbow running all over central New Mexico, but all sorts of clues were pointing to California. Jenny’s father and brother lived in Santa Barbara. Her first husband and the daughter she abandoned were there and her third lived in the San Francisco area. Questions needed to be asked and Porter couldn’t ask them, so he hired a P.I. in Los Angeles to do the job. That’s where Sharon Coulter came in. Like Jenny, she also started as a character of opportunity, an ex-cop from LA working as a P.I., but she quickly became an opportunity to explore another side of Rainbow Porter. Suddenly I had a new subplot. Porter and Sharon replaced Porter and Jenny. My problem with a short word count disappeared, but the new character was a cipher. All I had was a rough description and her name, Sharon. That was enough to keep me typing, but the woman still needed a character and I had no idea how she’d fit into the story. Then Sharon and Porter walked into a restaurant in Sausalito and Sharon limped as she walked. When I asked her (and, yes, authors do talk to their characters) I learned about the car thief who’d run her down, destroyed her hip, and ended her career with the police force. More important, I discovered her anger and her regret, not that she’d lost her job, but that she’d missed her shot at the man who took it. The injury left her with a wound and an obsession. Both helped her stand out as a character. That made writing her easier. She and Porter shared an understanding of violence, violence tempered by a rough appreciation for justice. Both had been damaged by their histories, and both had healed themselves to the extent that they could. More important, just as a broken bone is stronger along the old break, they each gained a strength Jenny could never match. Where did that leave Jenny? She remained the heart of the story but she was finally free of the plot constraints created by her relationship with Porter. She could return to her loom, to continue that metaphor, and examine what she had made of herself in the light of whatever self-knowledge she’d gained from the deaths and betrayals. She hadn’t lost anything to Sharon Coulter because Rainbow Porter had never been more to her than an occasional companion, a sounding board, and a bit of comfort when the nights grew too long. What she’d found far outweighed that: a fresh chance with the daughter she abandoned, a renewal with her discarded husband, and even a chance to reconnect with a father who’d never forgotten her. This entry was posted in Book Notes and Reviews, Character, Plot, Story, Writing Life and tagged Literature, novels on September 8, 2016 by Harlen Campbell.